Sur le tapis de ceste herbeuse rive ? Du feu qui m’ard d’une flamme trop vive. Qui seuls portoyent en crope les pucelles ? Par les forests vivoyent avecques elles ? On the carpet of this grassy bank? Of the fire which burns me with too bright a flame. Live with them in the forests? Another allusion to Ariosto, perhaps, in the reference to Paladins on chargers. His wry humour amuses me – why is it OK for heroes in storybooks to go off alone into the woods with maidens, without people whispering suspiciously about what they might get up to, but not for real people to do it…? In line 11, the maiden is ‘en crope’ : in case horse-jargon isn’t your thing, that is ‘on the crupper’, behind the saddle on the horse’s back. We might also say, ‘riding pillion’. Sur le tapis de ceste herbeuse rive ! And so we complete 150 sonnets from book 1; I shall update the ‘complete’ pdf shortly. [Edit: pdf uploaded.] Such is the size of Amours I that, even after more than 150 poems, we’re still less than two-thirds of the way through, however…! A qui je ne les conte, à Nymphe ny à Dieu. Se paistre d’autre apast, tant elle en est friande. Que mon ame pour vivre autre bien ne demande. And the wavering words of your last Farewell. To which I do not recount them, no Nymph nor god. To feed on any other food, so partial it is to this. That my soul asks no other good thing to live. I cannot imagine why Ronsard changed line 4 to “propos douteux”. What is it about “douteux” (doubtful) words which makes Ronsard carry them engraved in his heart, happily telling everything he meets, and asking for no more substantial fare?? I have translated as ‘wavering’ simply to try to get something positive out of the word! The earlier version, in Blanchemain, had “mots gracieux” (‘gracious words’) which fit the context of the rest so much better. 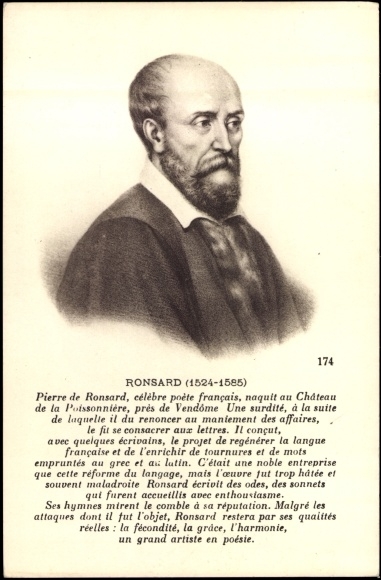 But that word “mot” was perhaps too unpoetical for the older Ronsard to accept – even though using such plain language was one of the things that made his name! There are no other changes from the early version. Debile je ne puis leurs regards endurer. Plus le Soleil esclaire, et moins on le regarde. Qu’il ne t’en-vole au ciel pour la terre empirer. Le visage trop beau n’est pas chose trop bonne. Danaé le sceut bien, dont l’or se fist trompeur. Tant ta chaste vertu le fait trembler de peur. I am weak and cannot endure their glances. The more the Sun shines, the less one can look upon him. That he does not steal you away to heaven, to make the earth a worse place. A face too fair is not something too good [for them]. Danaë knew it well, she whom gold itself deceived. So much does your chaste virtue make it tremble with fear. I do love it when Ronsard really gets the classical ‘bug’ and writes a tour de force of classicizing fantasy! And here he lets us know in the opening words we are in for a treat – how often is beauty ‘extreme’?? But he builds his poem carefully too – 4 lines of earthly normality, 4 of generalised fantasy about the gods, then 2×3 lines of classicizing with specific references to classical myth. The ‘sleeping dragons’ guarding the ‘golden apples’ of the Hesperides (the nymphs of the evening) recall the 11th labour of Hercules, tasked with obtaining the golden apples. In mythology the dragons were a singular but multi-headed dragon – but I think the plural allowable! Danae is of course the lady often depicted in Renaissance art welcoming Jupiter transformed into a shower of gold, by which she became pregnant with Perseus (who, incidentally, also later visited the Hesperides, but for weapons to fight Medusa not to retrieve apples; I certainly wouldn’t put it past Ronsard to be expecting us readers to see the ‘extra’ link to the Hesperides here). Qui pensent, la voyant, voir leur mesme Deesse. Un petit camp d’amours, qui jamais ne les laisse. Sur l’image de cire : ô bien-heureux servage ! Dont la terre est jalouse, et le ciel amoureux. Who believe, as they see her, they are seeing their own goddess. A small camp of cupids who never leave them. Over that waxen image: o truly happy servitude! Of whom earth herself is jealous, with whom heaven is in love. Blanchemain offers one variant line, at the end of the first quatrain: frankly a rather weak line compared to the improved version above! Qui l’adorent de loin ainsi que leur déesse. Who adore her from afar as well as their goddess. The second half of the poem begins with an initially rather confusing image – incense and wine yes, but burned hair? We are to imagine a voodoo-style ceremony, with the lover’s wax image being used to cast a spell over him. Incense, wine and (yes) burning hair are all part of making the spell as the sorcerer murmurs the magic words over the image. Note that Ronsard keeps switching between fanciful pictures (nymphs and cupids) and solid reality (coaches and churches): I think we can safely assume he is putting the magic spell into the fanciful category, a picture of how he is enslaved by love rather than a suggestion of how it came about…!